Tumor-infiltrating lymphocytes (TILs) are important prognostic factors in cancer progression and key players in cancer immunotherapy. Although γδ T lymphocytes can target a diversity of tumor cell types, their clinical manipulation is hampered by our limited knowledge of the molecular cues that determine γδ T cell migration toward tumors in vivo. In this study we set out to identify the chemotactic signals that orchestrate tumor infiltration by γδ T cells. We have used the preclinical transplantable B16 melanoma model to profile chemokines in tumor lesions and assess their impact on γδ TIL recruitment in vivo. We show that the inflammatory chemokine CCL2 and its receptor CCR2 are necessary for the accumulation of γδ TILs in B16 lesions, where they produce IFN-γ and display potent cytotoxic functions. Moreover, CCL2 directed γδ T cell migration in vitro toward tumor extracts, which was abrogated by anti-CCL2 neutralizing Abs. Strikingly, the lack of γδ TILs in TCRδ-deficient but also in CCR2-deficient mice enhanced tumor growth in vivo, thus revealing an unanticipated protective role for CCR2/CCL2 through the recruitment of γδ T cells. Importantly, we demonstrate that human Vδ1 T cells, but not their Vδ2 counterparts, express CCR2 and migrate to CCL2, whose expression is strongly deregulated in multiple human tumors of diverse origin, such as lung, prostate, liver, or breast cancer. This work identifies a novel protective role for CCL2/CCR2 in the tumor microenvironment, while opening new perspectives for modulation of human Vδ1 T cells in cancer immunotherapy. The recent success of the adoptive transfer of T lymphocytes to cancer patients has provided a great boost to immunotherapy (1). Consequently, there is increasing interest in manipulating lymphocyte populations capable of eliminating tumor cells. γδ T cells, which constitute 1–10% of human PBLs, are endowed with potent cytotoxic properties and have been shown to be important players in cancer immune surveillance (2). The antitumor role of γδ T cells has also been attributed to their rapid and abundant provision of cytokines like IFN-γ and TNF-α (3, 4). Importantly, tumor cell recognition by γδ T cells does not depend on MHC-mediated Ag presentation (2, 5), which may represent a key advantage to target advanced stages of cancer progression. Moreover, γδ T cells express high levels of a variety of activating NK receptors, thus conferring on them hybrid T cell/NK tumor recognition machinery (6). Seminal work with animal models has shown that the genetic absence of γδ T cells rendered mice significantly more susceptible to chemically induced (7), transplantable (3), spontaneous (8), and transgenic (9) tumors in vivo. Furthermore, extensive in vitro studies with human γδ T cells have demonstrated they can efficiently kill tumor cells of multiple tissue origins (10, 11). The antitumor properties of γδ T cells have been exploited in a series of cancer clinical trials focused on Vγ9Vδ2 cells, the major subset in human peripheral blood. As these cells are specifically reactive to nonpeptidic prenyl pyrophosphates (“phosphoantigens”) (12), which are available in clinical grade, they can be selectively activated in vivo or expanded in vitro for adoptive cell transfer (ACT). Although a number of trials obtained some promising results (10–33% objective responses in cancer patients) with the endogenous activation of Vγ9Vδ2 cells, the overall clinical performance of γδ T cells, particularly in ACT protocols, has been modest (11, 13). A key parameter in these immunotherapy strategies is the migration and homing of effector T cells to the tumor site, which is mostly controlled by chemokines and their receptors (14). However, the mechanisms that direct γδ T cells toward tumors remain largely unknown. This is of utmost relevance, not only for Vγ9Vδ2 cells but also for their Vδ1 counterparts (typically 10–35% of γδ PBLs), which are known to expand significantly in cancer patients (15) and to infiltrate multiple human tumor types (16–20) while also producing IFN-γ and being strongly cytotoxic against tumor cells. In fact, our recent work has characterized a population of NKp30+ Vδ1 cells with enhanced tumor-killing capacity, compared with that of Vγ9Vδ2 cells (21), which may have an important application in cancer immunotherapy. Moreover, tumor-infiltrating Vδ1 cells were numerically enriched and displayed enhanced cytotoxity when compared with Vδ2 cells in a collection of 74 primary cutaneous melanomas (19). In addition, in hematological malignancies, Vδ1 cells have been shown to be the main responding γδ T cell subset against acute leukemic blasts, and the importance of this antitumor reactivity is reflected in the strong correlation between donor-derived γδ T cells and long-term survival of patients who underwent allogeneic bone marrow transplantation (22, 23). Female mice were used at 6–10 wk of age. C57BL/6 (B6) mice were obtained from Charles River or The Jackson Laboratory; B6.Tcrd−/− and B6.Ccl2−/− mice were obtained from The Jackson Laboratory; B6.Ccr2−/− mice were provided by the Oswaldo Cruz Foundation breeding unit (Rio de Janeiro, Brazil). A total of 5 × 104 B16-F0 melanoma cells (American Type Culture Collection) were injected (in 50 μl PBS) s.c. into the backs of isoflurane-anesthetized mice. Tumor size was measured with a caliper in two perpendicular dimensions every 2–3 d.
Tumors were harvested and treated for 30 min (in shaker at 37°C) with 5 mg/ml Collagenase D (Roche) and 200 mg/ml DNase (Roche). Tissues were mashed through a 40-μm filter to generate single-cell suspensions. After red blood cell lysis, samples were mAb stained for 20 min at 4°C with γδTCR-PE, CD3-PerCPCy5.5, CD27-PeCy7, CD8-FITC, CD4-PB, CD45-APC-Cy7, CD11b-APC, Gr1-PE, F4/80-FITC, and CD11c-PerCPCy5.5 (all from eBioscience); CCR2-APC (R&D Systems); Vγ4-PE (BioLegend); and Vγ1-FITC (a kind gift from Pablo Pereira, Pasteur Institute, Paris, France). Samples were analyzed by flow cytometry on a FACS Fortessa, or sorted on a FACSAria III (BD Biosciences). FACS-sorted (>98% pure) γδ T cells were activated for 48 h with 1 μg/ml plate-bound anti-CD3 mAb (BD Pharmingen). B16 cells were stained with DDAO-SE (Invitrogen) and incubated for 3 h in the absence or presence of γδ T cells (at indicated E:T ratios). Washed and EDTA-detached tumor cells were stained with Annexin V (eBioscience) and analyzed by flow cytometry. Protein extracts (100 μg total protein) from tumors isolated at day 14 from C57BL/6 or Tcrd−/− mice were incubated with membranes of the Quantibody Mouse Chemokine Array (RayBiotech) and developed by chemiluminescence according to the manufacturer´s instructions. Chemokine concentrations were measured (based on internal controls) using Un-Scan-It software. Intracellular calcium concentrations ([Ca2+]i) on preplated γδ T cells (2 × 105 per well) exposed to CCL2 (0.1–10 nM) were measured using the FLIPR Calcium Plus Assay Kit on FlexStation II (Molecular Devices) fluorometric microplate reader, with fluorescence intensity ratios at 485/525 nm (λex/λem) recorded up to 5 min, and analyzed using SoftMax Pro. Lymphocyte chemotaxis was determined using HTS Transwell 96-well permeable supports (5 μm pore size) (Corning). Plain RPMI 1640 medium or that supplemented with 10 nM recombinant mouse CCL2 (R&D Systems) or recombinant human CCL2 (PeproTech), or with total protein extracts from tumors excised from C57BL/6 [wild-type (WT)] mice at 14 d post transplantation, was added to the bottom wells of the chamber. In the indicated wells, anti-CCL2 Ab (R&D Systems) was added (for 30 min before the assay). Murine γδ T cells from spleen and lymph nodes of WT mice were MACS sorted (purity > 95%). Human Vδ1 and Vδ2 T cells were FACS sorted (purity > 98%) from peripheral blood of healthy volunteers and were activated for 7 d (in RPMI 1640 medium) with 4 μg/ml PHA (Sigma) or 10 nM of 4-hydroxy-3-methyl-but-2-enyl pyrophosphate (HMB-PP; Echelon Biosciences) in the presence of 100 U/ml IL-2. The top wells were loaded with 5 × 104 γδ T cells. After 3 h incubation at 37°C, filters were removed and cells that migrated to the lower chamber were counted. Chemotaxis index was calculated as the ratio of cells migrating toward rCCL2 (or the tumor extracts) and cells randomly migrating across the membrane. Total RNA was extracted and reverse transcribed, and quantitative PCR was performed as described (21). Primer sequences and methodology details are available upon request. PBLs were isolated as described (21), and Vδ1 and Vδ2 T cell subsets were either analyzed ex vivo or sorted for in vitro cultures. Cells were activated for 7 d (in RPMI 1640 medium) with 4 μg/ml PHA (Sigma-Aldrich) or 10 nM HMB-PP (Echelon Biosciences), in the presence of 100 U/ml IL 2. CCR2 surface expression was assessed by flow cytometry using the CCR2-PerCPCy5.5 mAb (BioLegend). Microarray data were obtained from previously published studies using the Human Exon 1.0 ST platform and available in the Gene Expression Omnibus database (www.ncbi.nlm.nih.gov/geo/) for breast cancer (GSE33692), colorectal cancer (GSE24551), gastric cancer (GSE27342), liver cancer (GSE12941), lung adenocarcinoma (GSE12236), oral squamous cell carcinoma (GSE25099), ovarian cancer (GSE29156), and primary and metastatic prostate cancer (GSE21034). Determination of significant deregulation was determined by AltAnalyze application (41), using a moderated t test with Benjamini–Hochberg p value correction. The statistical significance of differences between populations was assessed using the Student t test and is indicated when significant as *p < 0.05, **p < 0.01, and ***p < 0.001. All experiments were performed in compliance with relevant laws and institutional guidelines and have been approved by local ethics committees. We selected the murine B16 melanoma cell line for transplantation, given its extensive validation as a relevant preclinical tumor model (3, 35–40) and the solid evidence for γδ T cell infiltration in human melanoma (19). Palpable tumors were detected 7–9 d after s.c. injection of B16-F0 cells, and they were measured until day 14, at which time tumor infiltrates were analyzed by flow cytometry. Approximately 1 in 40 infiltrating lymphocytes was found to be a γδ T cell mostly expressing either Vγ4 or Vγ1 TCR chains (Fig. 1A), like lymph node (circulating) but not skin-resident γδ T cells (42). γδ TILs also expressed CD27 (Fig. 1B) and ifng (Fig. 1C), characteristic of the most abundant peripheral γδ T cell subset (43). IFN-γ (but not IL-17 or IL-4) production was also detected in tumor-draining lymph nodes (Supplemental Fig. 1A and data not shown). Importantly, γδ-TILs expressed the cytotoxic effector molecules pfn and gzmb (Fig. 1C) and were able to kill B16 tumor cells in vitro (Fig. 1D). Furthermore, mice lacking γδ T cells developed significantly larger tumors than did WT controls at each time point analyzed (Fig. 1E), thus indicating accelerated tumor cell growth in vivo (Supplemental Fig. 1B). These results, which are consistent with and further expand on a previous study by Gao et al. (3), demonstrate a nonredundant protective role for cytotoxic and IFN-γ–producing (type 1) γδ-TILs in the B16 tumor model, making it a particularly suitable system to analyze the in vivo requirements of γδ T cell recruitment. Murine cytotoxic γδ T cells infiltrate B16 lesions and delay tumor growth in vivo. Mice were injected s.c. with 5 × 104 B16-F0 melanoma cells, and tumor size was measured every 2–3 d up to 14 d. Tumors were harvested and digested for analysis of leukocyte infiltrates. (A and B) Representative flow cytometry plot and numbers of total γδ (gated on CD3+ TCRγδ+) or Vγ4+ or Vγ1+ TILs in day 14 tumors from C57BL/6 WT mice (A), and fraction of CD27+ cells within each subset (B). (C) Total γδ, CD8+, or CD4+ tumor-infiltrating T cells were sorted 9 d post transplantation and analyzed by quantitative RT-PCR for expression of ifng, pfn, and gzmb, normalized to hprt and expressed in arbitrary units. Bars indicate SD (n = 3). (D) In vitro killing assay with peripheral (spleen and lymph nodes) FACS-sorted, activated γδ T cells and DDAO-SE–labeled B16-F0 tumor cells (at indicated tumor:effector ratios). Annexin V staining was performed after 3 h of coincubation and analyzed by flow cytometry. Bars indicate SD (n = 3). (E) Tumor growth in WT or Tcrd−/− mice. Each dot represents one mouse. Average tumor size and statistical differences (*p < 0.05) are indicated. We next used this tumor model to identify the chemokines involved in γδ T cell recruitment in vivo. We hypothesized that B16 lesions in TCRδ-deficient mice would accumulate chemokines normally consumed by γδ T cells during tumor infiltration (in WT mice). We therefore used a chemokine array to analyze protein extracts derived from B16 tumors isolated (at day 14 post transplantation) from WT or TCRδ-deficient mice. Among the 25 chemokines profiled (Fig. 2, Supplemental Fig. 2), the CCR2 ligands CCL2 and CCL12 were significantly overexpressed in TCRδ-deficient mice (Fig. 2). This pattern was highly selective: in particular, it did not extend to CXCL9 and CXCL11 (Fig. 2) or CXCL16 (Supplemental Fig. 2), all implicated in CD8+ TIL recruitment; or to CXCL12 (Fig. 2) and CCL19 (Supplemental Fig. 2), typically associated with lymph node homing. Furthermore, CCL25 and CCL27, previously shown to control γδ T cell migration under homeostatic or inflammatory conditions (24, 33), were also equally expressed in WT and TCRδ-deficient mice (Supplemental Fig. 2). These data suggested a potential selective role for CCR2 ligands in governing γδ T cell recruitment to B16 tumors. CCL2 and CCL12 accumulate in B16 tumor lesions lacking γδ T cells. Chemokine concentrations in protein extracts from day 14 tumors isolated from WT or Tcrd−/− mice, as measured by Quantibody Chemokine Mouse Array (Raybiotech). Bars indicate SD. n = 3; *p < 0.05, **p < 0.01. Building on previous results, we focused on the components of the CCR2/CCL2 pathway and assessed their relevance for γδ T cell migration. Surface CCR2 expression was detected on 20–30% of γδ T cells isolated from spleen or peripheral lymph nodes (Fig. 3A). 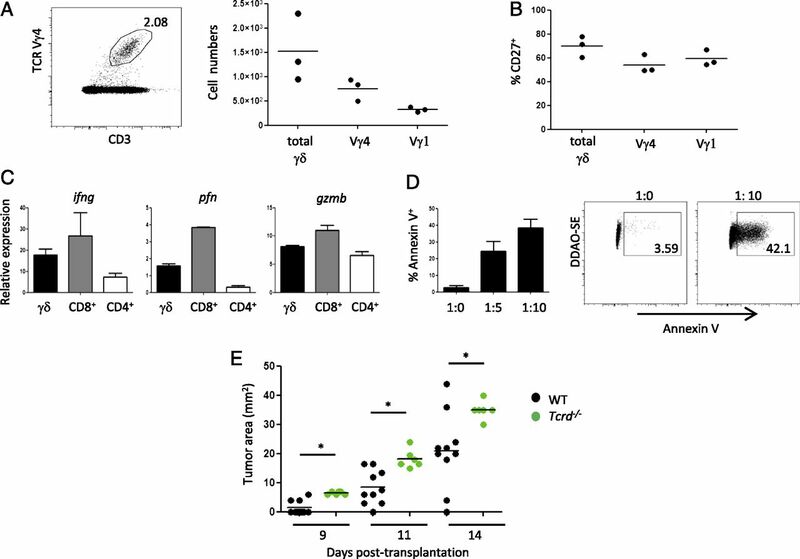 Both Vγ1+ and Vγ4+ cells constitutively expressed CCR2 (Fig. 3B and data not shown) and markedly upregulated it upon activation (Fig. 3B, 3C). Importantly, when purified γδ T cells were incubated with increasing doses of recombinant CCL2, they responded robustly by fluxing calcium (Fig. 3D) and migrating in a Transwell system (Fig. 3E). To establish a direct link to the tumor model, we prepared protein extracts from excised B16 tumors (grown in vivo) and used them as “bait” for purified γδ T cells in vitro. We observed a striking migration (chemotaxis index ∼ 30) of γδ T cells toward the B16 protein extracts and, critically, this was significantly inhibited by neutralizing anti-CCL2 mAbs (Fig. 3F). These data clearly demonstrate that murine γδ T cells use the CCR2/CCL2 chemokine pathway to migrate toward CCL2-rich B16 tumors in vitro. Murine γδ T cells express CCR2 and migrate toward CCL2 in vitro. (A) Ex vivo CCR2 expression in splenic and lymph node γδ T cells (gated on CD3+ TCRγδ+ lymphocytes) from WT C57BL/6 mice was assessed by flow cytometry. Each dot represents one mouse. (B) CCR2 expression in resting (gray filled) and activated (black line) Vγ1+ T cells from lymph nodes. (C) CCR2 expression in activated Vγ1+ (gray filled) or Vγ4+ (black line) splenocytes. CD3+ TCRγδ+ cells were FACS sorted from spleen or lymph nodes; activated on plate-bound anti-CD3ε (3 μg/ml) and soluble anti-CD28 (3 μg/ml) mAbs for 48 h; and stained for Vγ1+ TCR, Vγ4+ TCR, and CCR2 for FACS analysis. Indicated percentages of CCR2+ cells were defined relative to negative control (without anti-CCR2 mAb). (D) Calcium influx assay on MACS-sorted γδ T cells from spleen and lymph nodes exposed to indicated concentrations of recombinant CCL2 in HBSS buffer. RFU, relative fluorescence units. (E and F) In vitro chemotaxis assays of MACS-sorted γδ T cells from spleen and lymph nodes toward recombinant CCL2 (E) or protein extracts derived from day 14 tumors of WT mice (F) in Transwell plates. Where indicated, anti-CCL2 neutralizing Ab was added. Bars indicate SD. **p < 0.01, ***p < 0.001. Following these results in mice, we next investigated the potential role of CCR2/CCL2 in the migration of human γδ T cells. Total γδ PBLs clearly responded to increasing doses of recombinant CCL2 in vitro (Fig. 4A, Supplemental Fig. 3). Because human γδ-PBLs contain two major subsets that express either Vδ1 (5–30%) or Vδ2 (60–95%) chains, we determined CCR2 expression in both populations. Of interest, only Vδ1 PBLs expressed CCR2 either constitutively (Fig. 4B) or after activation with the mitogen PHA (in the presence of IL-2) (Fig. 4C). By contrast, Vδ2 PBLs lacked CCR2 expression under both conditions, as well as upon activation with the specific Vγ9Vδ2-TCR agonist HMB-PP (Fig. 4C, lower panel). Consistent with these data, Vδ1 (but not Vδ2) PBLs migrated (chemotaxis index > 1) toward CCL2 in vitro (Fig. 4D). These data validate our findings in mice and suggest that CCR2/CCL2 may play a key role in the recruitment of human Vδ1 PBLs. Human Vδ1 T cells express CCR2 and migrate toward CCL2 in vitro. (A) Relative fluorescence units (RFU) from calcium influx assays on in vitro expanded γδ T cells from human peripheral blood exposed to increasing concentrations of recombinant CCL2. 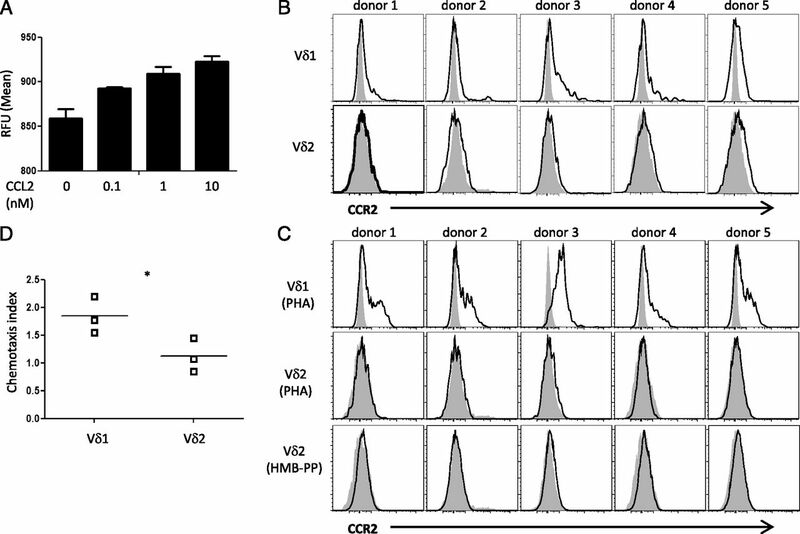 (B and C) CCR2 expression on freshly isolated (B) or activated (C) Vδ1 and Vδ2 T cells from five healthy donors. Activation was performed for 7 d with either PHA or HMB-PP, always in the presence of IL-2. (D) Vδ1 or Vδ2 T cells were FACS sorted from peripheral blood of healthy donors and activated in vitro for 1 wk. Chemotaxis (Transwell) assays toward recombinant human CCL2 were performed for 3 h. Each dot represents one blood donor. *p < 0.05. We next investigated how Ccl2 levels were regulated in human malignancies. We took a bioinformatics approach to inquire into public genome-wide Human Exon 1.0 ST microarray data. Comparison of tumors and corresponding healthy tissues revealed a significant deregulation of Ccl2 levels in most (6 of 9) tumor types analyzed (see Materials and Methods for details). On one hand, oral squamous cell carcinoma, breast cancer, and primary prostate cancer showed significant upregulation of Ccl2 expression (Fig. 5A). On the other hand, metastatic prostate cancer, liver cancer, and lung cancer displayed reduced Ccl2 levels (Fig. 5B). These data reveal a striking heterogeneity of Ccl2 levels in human tumors that may have critical implications for Vδ1 T cell recruitment or infiltration in immune surveillance and immunotherapy. Ccl2 expression is deregulated in various human tumor types. Ccl2 expression levels in human tumor types (gray) and corresponding normal tissue (black) according to Human Exon 1.0 ST microarray data (see Materials and Methods for details). Data were analyzed using AltAnalyze with a moderated t test by the Benjamini–Hochberg p value correction (*adjusted p value < 0.05). To test the involvement of CCL2 and CCR2 in the in vivo migration of γδ T cells (and other leukocytes) toward tumors, we analyzed the infiltrating populations (gating strategies shown in Supplemental Fig. 4A) in B16 lesions of CCL2-deficient and CCR2-deficient mice. We observed a significant reduction of γδ T cell infiltrates in Ccl2−/− (Fig. 6A) and Ccr2−/− (Fig. 6B) mice when compared with WT controls. This finding contrasted with the equivalent numbers of tumor-infiltrating CD8+ and CD4+ T cells in these strains (Fig. 6C). In contrast, and as expected, myeloid populations (macrophages, neutrophils, and myeloid-derived suppressor cells) were strongly reduced in tumors from Ccr2−/− mice (Supplemental Fig. 4B). Most importantly, the overall tumor growth rate was higher in Ccr2−/− mice in experiments conducted in two animal facilities, with distinct housing conditions and microbial colonization, across two continents (Fig. 6D). Collectively, our data demonstrated an unanticipated protective role for the CCR2/CCL2 pathway associated—for the first time, to our knowledge—with the recruitment of antitumor type 1 cytotoxic γδ T cells to tumor beds. The CCR2/CCL2 pathway is required for γδ T cell recruitment to B16 tumors in vivo. WT, Ccl2−/−, or Ccr2−/− mice were injected s.c. with 5 × 104 B16-F0 cells and sacrificed after 14 d. Numbers of total γδ (gated on CD3+ TCRγδ+ lymphocytes) (A and B) or CD8+ and CD4+ (C) TILs. (D) Tumor size, in experiments carried out in two animal facilities in Lisbon, Portugal (Instituto de Medicina Molecular) and Rio de Janeiro, Brazil (Fundação Oswaldo Cruz). Each dot represents one tumor/one mouse. *p < 0.05. This study demonstrates that γδ T cells use the CCR2/ CCL2 pathway to migrate toward tumors, where they exert a key nonredundant antitumor function. It also reveals a protective role for inflammatory CCR2/CCL2 chemokine signals, which have been mostly associated with promotion of tumor growth through recruitment of myeloid cells, particularly monocytes/ macrophages (44, 45). Our analysis of tumor infiltrates in Ccr2−/− mice data confirmed these findings, while also showing a striking reduction in myeloid-derived suppressor cells, which can actively suppress antitumor CD8+ (46) and γδ T cells (T. Lanka and B. Silva-Santos, unpublished observations). However, and strikingly, the overall phenotype of Ccr2−/− mice (compared with that in WT controls) was enhanced tumor growth, which suggests a dominance of CCR2/CCL2 antitumor functions over their protumor effects in this preclinical model. This finding is consistent with a recent report showing increased tumor growth and metastasis in Ccl2−/− mice, associated with the infiltration of CD8+ and CD4+ T cells, but γδ T cells were not analyzed (47). The balance between antitumor and protumor roles of CCL2 may depend on the composition of the tumor leukocyte infiltrates (relative abundance of each subset), as well on intrinsic CCL2 levels, because different leukocyte populations may have distinct thresholds for CCL2-mediated accumulation. This idea should be further investigated in various preclinical models and, most importantly, associated with clinical data on tumor infiltrates upon evaluation of CCL2 levels in situ. Although CCL2 has been previously implicated in mediating the recruitment of CD8+ T cells (47, 48), in our study CD8+ T cell numbers were unaffected in B16 lesions of Ccr2−/− or Ccl2−/− mice. It is possible that posttranslational inactivating modifications of CCL2 may prevent effective CD8+ T cell recruitment in WT mice, thus permitting rapid tumor growth. This suggestion follows from an elegant study showing that intratumoral reactive nitrogen species induce CCL2 nitration that prevents CD8+ T cell infiltration (49). Notwithstanding, our study provides, to our knowledge, the first evidence for an antitumor role of CCL2 linked to γδ T cell recruitment, representing an important addition to the pleiotropic functions of CCL2 in the tumor microenvironment. It is notable that despite γδ T cells accounting for < 3% of leukocyte infiltrates in B16 lesions, their absence (in Tcrd−/− mice) results in a significant accumulation of CCL2 (Fig. 2). Recently, members of our team have shown that CCL25 and its receptor CCR9 control the migration and lung recruitment of a subset of γδ T cells committed to IL-17 production in a model of allergic pleurisy (33). In fact, the effect of CCL25 was selective to IL-17+ γδ cells—namely, not extending to IFN-γ–producing γδ T cells. In view of our data presented in this article, together with other studies by our team (31), we propose that, instead of CCR9/CCL25, the key determinants of murine IFN-γ+ γδ cell migration are CCR2/CCL2. Importantly, our study is, to our knowledge, the first to identify a chemokine pathway responsible for in vivo γδ T cell recruitment in a tumor setting. Furthermore, our demonstration that human Vδ1 PBLs also migrate toward CCL2 stresses the importance of investigating the role of this chemokine in Vδ1 T cell recruitment to inflammatory sites in human disease. In this context, our bioinformatics analyses revealed a deregulation of Ccl2 expression in multiple human tumor types. Oral squamous cell carcinoma, breast cancer, and primary prostate cancer showed significant upregulation of Ccl2 expression (Fig. 5A), which may render these tumors particularly susceptible to Vδ1 T cell recruitment. This finding is fully consistent with a study that showed very abundant Vδ1 T cell infiltration in breast and prostate tumors (18). In contrast, liver and lung cancer displayed reduced Ccl2 levels (Fig. 5B), which is likely to confer resistance to Vδ1 T cell infiltration. In fact, it is interesting to speculate that downregulation of Ccl2 expression may constitute an evasion strategy against Vδ1 T cell–mediated immune surveillance. Along these lines, the prostate cancer series showed a strong reduction of Ccl2 levels between primary and metastatic tumors (Fig. 5A, 5B). Future studies should test the association between Vδ1 T cell infiltrates and Ccl2 expression in situ, because CCL2 expression in tumors may constitute an important prognostic factor for future Vδ1 T cell–based cancer immunotherapies. Of note, human γδ T cells express other chemokine receptors like CCR5 and CXCR3, and have been shown to also migrate in vitro toward CCL3, CCL4, CCL5, CXL10, CXCL11, and CXCL12 (25–28). Thus, it will be worthwhile to assess the relative contributions of these pathways, in addition to CCR2/CCL2, to tumor infiltration by γδ T cells, particularly Vδ1 PBLs. Regarding the potential of Vδ1 PBLs for ACT-based cancer immunotherapy, we have recently shown that this subset is uniquely endowed, among γδ T cells, with the capacity to express natural cytotoxicity receptors that enhance their killing of hematological (21) and solid (D.V. Correia and B. Silva-Santos, unpublished observations) tumors. Moreover, Vδ1 cells were the dominant tumor-infiltrating T cell population found in a collection of 74 primary cutaneous melanomas (19). However, other studies by Peng and colleagues (18) detected poor infiltration of Vδ1 T cells, as well as total γδ T cells (50), in melanoma biopsy specimens. By contrast, γδ T cells, and Vδ1 cells in particular, were abundant in breast and prostate tumors. In vitro functional assays demonstrated that Vδ1 cells derived from breast cancer biopsies inhibited the maturation and function of dendritic cells, and suppressed proliferation and IL-2 production of CD4+ T cells (18). Recent data have further shown that γδ TILs positively correlated with Foxp3+ suppressive T cells in advanced breast tumors and inversely correlated with relapse-free and overall survival of breast cancer patients (50). These findings raise interesting questions for future investigation: Do distinct suppressive versus cytotoxic Vδ1 T cell subsets exist? Do these differentially infiltrate tumor types, such as melanoma or breast cancer? Can the (breast or prostate) tumor microenvironment manipulate Vδ1 T cells toward immunosuppression? In any case, we believe Vδ1 T cells will be a key population to consider in developing cancer immunotherapy strategies. On the basis of results presented in this article, we propose CCL2 as a promising target for manipulation of Vδ1 T cells. Importantly, as blocking anti-CCL2 Abs are being evaluated in prostate and ovarian cancer clinical trials (51), our data also indicate caution regarding the unexpected effects of this therapeutic strategy. We therefore suggest that future research should aim at integrating the effects of CCL2 on tumor-infiltrating leukocyte subsets with strikingly distinct functions (52) in both preclinical models and cancer immunotherapy trials. The authors have no financial conflicts of interests. We thank Dr. Claudia Benjamim, Dr. Fernanda Kyle, Amanda Rotay, Thadeu Costa, Adriana Carvalho, Bruno Paredes, Gerlind Wallon, Rachel Coulthard, and the staffs of the flow cytometry units and, especially, the animal core facilities. This work was supported by the European Molecular Biology Organization Young Investigator Programme and the European Research Council (StG_260352) (to B.S.-S.); Fundação Carlos Chagas Filho de Amparo à Pesquisa do Estado do Rio de Janeiro and Conselho Nacional de Desenvolvimento Científico e Tecnológico (to C.P. ); and fellowships from Fundação para a Ciência e Tecnologia (to T.L. and A.R.G.).
. 2010. Gammadelta T cell effector functions: a blend of innate programming and acquired plasticity. Nat. Rev. Immunol. 10: 467–478.
. 2007. Self/non-self discrimination by human gammadelta T cells: simple solutions for a complex issue? Immunol. Rev. 215: 123–135.
. 2013. Tumor cell recognition by γδ T lymphocytes: T-cell receptor vs. NK-cell receptors. OncoImmunology 2: e22892.
. 2004. Innate immune surveillance of spontaneous B cell lymphomas by natural killer cells and gammadelta T cells. J. Exp. Med. 199: 879–884.
. 2008. Protective immunosurveillance and therapeutic antitumor activity of gammadelta T cells demonstrated in a mouse model of prostate cancer. J. Immunol. 180: 6044–6053.
. 2010. Targeting γδ T lymphocytes for cancer immunotherapy: from novel mechanistic insight to clinical application. Cancer Res. 70: 10024–10027.
. 2012. Harnessing γδ T cells in anticancer immunotherapy. Trends Immunol. 33: 199–206.
. 2012. The pros and cons of chemokines in tumor immunology. Trends Immunol. 33: 496–504.
. 1996. Human intestinal Vdelta1+ lymphocytes recognize tumor cells of epithelial origin. J. Exp. Med. 183: 1681–1696.
. 1998. Recognition of stress-induced MHC molecules by intestinal epithelial gammadelta T cells. Science 279: 1737–1740.
. 2007. Tumor-infiltrating gammadelta T cells suppress T and dendritic cell function via mechanisms controlled by a unique toll-like receptor signaling pathway. Immunity 27: 334–348.
. 2012. Characterization of human γδ T lymphocytes infiltrating primary malignant melanomas. PLoS ONE 7: e49878.
. 2012. Analysis of Vδ1 T cells in clinical grade melanoma-infiltrating lymphocytes. OncoImmunology 1: 1297–1304.
. 2011. Differentiation of human peripheral blood Vδ1+ T cells expressing the natural cytotoxicity receptor NKp30 for recognition of lymphoid leukemia cells. Blood 118: 992–1001.
. 2007. Long term disease-free survival in acute leukemia patients recovering with increased gammadelta T cells after partially mismatched related donor bone marrow transplantation. Bone Marrow Transplant. 39: 751–757.
. 2001. Human gammadelta(+) T lymphocytes have in vitro graft vs leukemia activity in the absence of an allogeneic response. Bone Marrow Transplant. 27: 601–606. 2012. Driving IL-17⁺ γδ T-cell migration in allergic reactions: a new “inflammatory” role for the “homeostatic” chemokine CCL25. Eur. J. Immunol. 42: 1097–1101.
. 2003. Features and functions of gamma delta T lymphocytes: focus on chemokines and their receptors. Crit. Rev. Immunol. 23: 339–370.
. 2004. Migration of V delta 1 and V delta 2 T cells in response to CXCR3 and CXCR4 ligands in healthy donors and HIV-1-infected patients: competition by HIV-1 Tat. Blood 103: 2205–2213.
. 2003. Flexible migration program regulates gamma delta T-cell involvement in humoral immunity. Blood 102: 3693–3701.
. 1998. Transendothelial chemotaxis of human alpha/beta and gamma/delta T lymphocytes to chemokines. Eur. J. Immunol. 28: 104–113. 2000. [gamma][delta] cells: a right time and a right place for a conserved third way of protection. Annu. Rev. Immunol. 18: 975–1026.
. 2001. 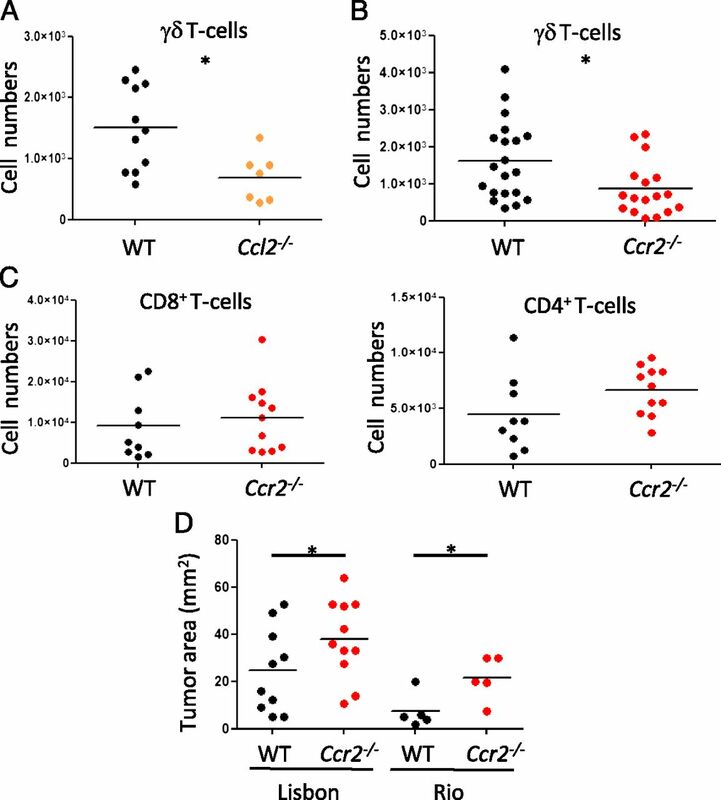 Mice lacking the CCR9 CC-chemokine receptor show a mild impairment of early T- and B-cell development and a reduction in T-cell receptor gammadelta(+) gut intraepithelial lymphocytes. Blood 98: 2626–2632.
. 2008. 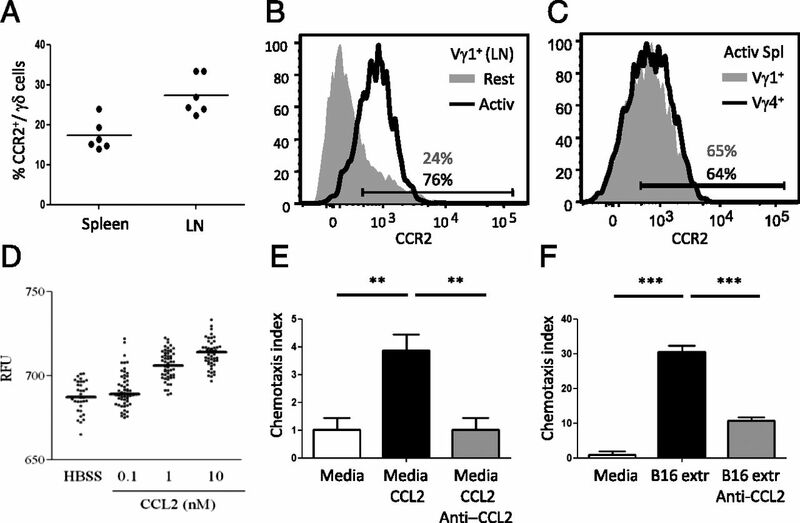 Involvement of CC chemokines in gammadelta T lymphocyte trafficking during allergic inflammation: the role of CCL2/CCR2 pathway. Int. Immunol. 20: 129–139.
. 2003. Role of monocyte chemotactic protein-1/CC chemokine ligand 2 on gamma delta T lymphocyte trafficking during inflammation induced by lipopolysaccharide or Mycobacterium bovis bacille Calmette-Guérin. J. Immunol. 171: 6788–6794.
. 2012. CCL25 induces α4β₇ integrin-dependent migration of IL-17+ γδ T lymphocytes during an allergic reaction. Eur. J. Immunol. 42: 1250–1260.
. 2005. Interferon-inducible protein 10, but not monokine induced by gamma interferon, promotes protective type 1 immunity in murine Klebsiella pneumoniae pneumonia. Infect. Immun. 73: 8226–8236.
. 2002. Efficacious immunomodulatory activity of the chemokine stromal cell-derived factor 1 (SDF-1): local secretion of SDF-1 at the tumor site serves as T-cell chemoattractant and mediates T-cell-dependent antitumor responses. Blood 100: 1551–1558.
. 2010. Induction of lymphoidlike stroma and immune escape by tumors that express the chemokine CCL21. Science 328: 749–752.
. 2010. IL-17 promotes tumor development through the induction of tumor promoting microenvironments at tumor sites and myeloid-derived suppressor cells. J. Immunol. 184: 2281–2288.
. 2010. PD-1 and CTLA-4 combination blockade expands infiltrating T cells and reduces regulatory T and myeloid cells within B16 melanoma tumors. Proc. Natl. Acad. Sci. USA 107: 4275–4280.
. 2011. Induction of monocyte chemoattractant protein-1 and interleukin-10 by TGFbeta1 in melanoma enhances tumor infiltration and immunosuppression. Cancer Res. 71: 812–821.
. 2012. Monocytic CCR2(+) myeloid-derived suppressor cells promote immune escape by limiting activated CD8 T-cell infiltration into the tumor microenvironment. Cancer Res. 72: 876–886.
. 2009. Alternative splicing in the differentiation of human embryonic stem cells into cardiac precursors. PLOS Comput. Biol. 5: e1000553.
. 2002. Gammadelta T cells: functional plasticity and heterogeneity. Nat. Rev. Immunol. 2: 336–345.
. 2009. CD27 is a thymic determinant of the balance between interferon-gamma- and interleukin 17-producing gammadelta T cell subsets. Nat. Immunol. 10: 427–436.
. 2010. The chemokine system in cancer biology and therapy. Cytokine Growth Factor Rev. 21: 27–39.
. 2012. Host-derived MCP-1 and MIP-1α regulate protective anti-tumor immunity to localized and metastatic B16 melanoma. Am. J. Pathol. 180: 365–374.
. 2010. A dendritic cell population generated by a fusion of GM-CSF and IL-21 induces tumor-antigen-specific immunity. J. Immunol. 185: 7358–7366.
. 2011. Chemokine nitration prevents intratumoral infiltration of antigen-specific T cells. J. Exp. Med. 208: 1949–1962.
. 2012. Tumor-infiltrating γδ T lymphocytes predict clinical outcome in human breast cancer. J. Immunol. 189: 5029–5036. 2009. First results for agents targeting cancer-related inflammation. J. Natl. Cancer Inst. 101: 1110–1112.
. 2012. The split nature of tumor-infiltrating leukocytes: implications for cancer surveillance and immunotherapy. OncoImmunology 1: 717–725.